The trombone is one of the most delicate of musical instruments. It cannot be built heavy enough to withstand damage whilst being light enough for an effortless performance. The outer slide uses the lightest metal found on any instrument, so it must be handled with great care and placed in its case when not in use. To oil the slide, hold the slide by the first brace, point towards the ground, unlock the slide lock and gently rest the slide on the ground. Apply the slide oil to the top of the inner slide and let it work its way down. Now work the oil by moving the slide up and down. It should move freely and without force. Once you’ve done that lock the slide again. Keep the slide pointed downwards in your right hand with the taller part of the slide towards you. Now take the bell in your left hand and place the receiver (where there is a circular tightening nut) on the taller part of the slide. The bell should be to the left of the slide. Create a ‘V’ between the bell and the slide, forming a right angle, and tighten the nut. Place the trombone back in its case and remember to do your case up correctly. Whether it’s the sound of the symphonic trombone or the marching band trombone, it is a sound to be reckoned with! The trombone is a deep, soulful and versatile instrument. Its unique slide and powerful sound makes it a great choice for any aspiring musician. 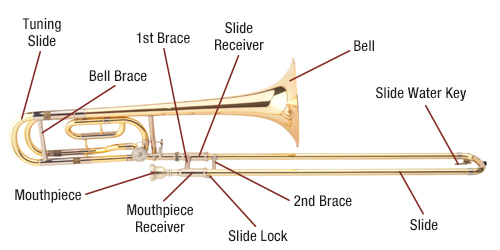 What type of trombone does my child need? The trombone you will start on will be a B-flat tenor student model. Some brands and models that are perfect for students starting out are: Yamaha YSL154, Jupiter 432L, Carol Brass student tenor trombone and P-Bone Mini Plastic Trombone.